Coach: "Creating Your Own Personal Brand: It's Yours for the Taking" -- In a free Workshop on October 17, 2006, Life Coach Jim Arnoff conducted an interactive workshop to help people pitch themselves. 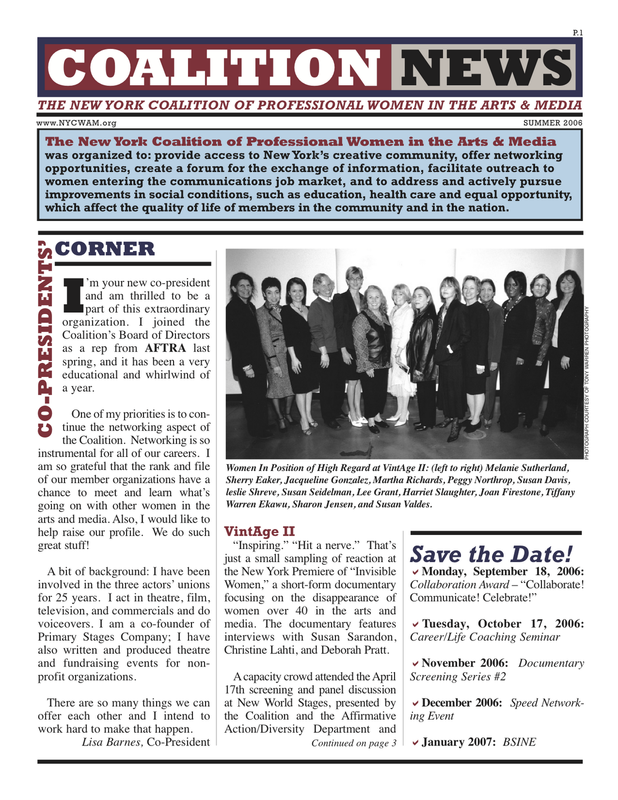 New York Coalition of Professional Women in the Arts and Media held "Collaborate! Communicate! Celebrate!" -- the First Collaboration Award Event on September 18, 2006, at the Cherry Lane Theatre, 38 Commerce Street, in Greenwich Village. 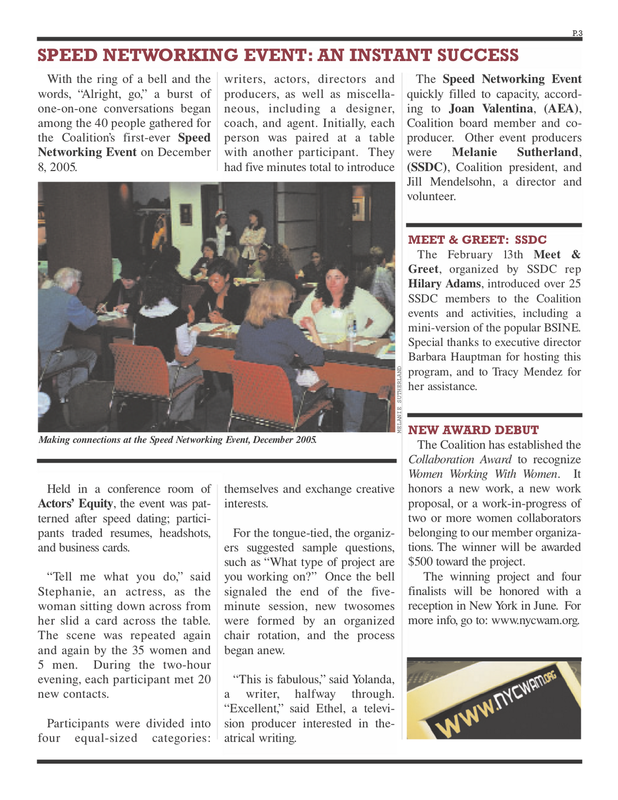 The event was designed to honor the winners of the Coalition's first Collaboration Award, Women Working With Women. 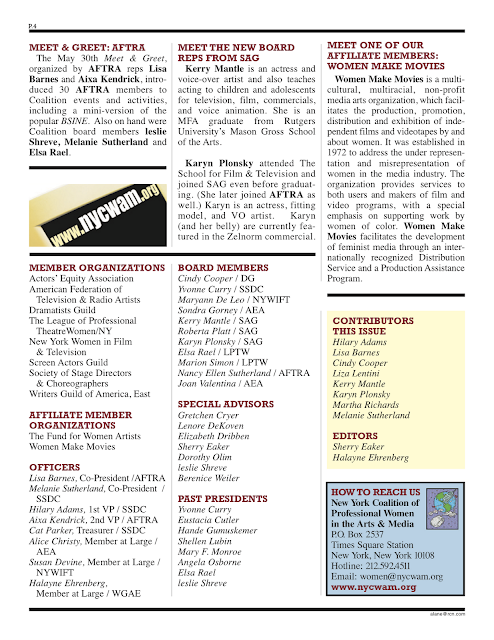 Sherry Eaker, Editor-at-Large of Backstage Magazine, and leslie Shreve, National Co-Chair of the Women's Committees of SAG and AFTRA, collaborated as moderators. The evening feature performances, awards, interviews, networking and a reception. Playwright Jennifer Maisel and Director Wendy McClellan will receive the first Collaboration Award presented by The New York Coalition of Professional Women in the Arts & Media. 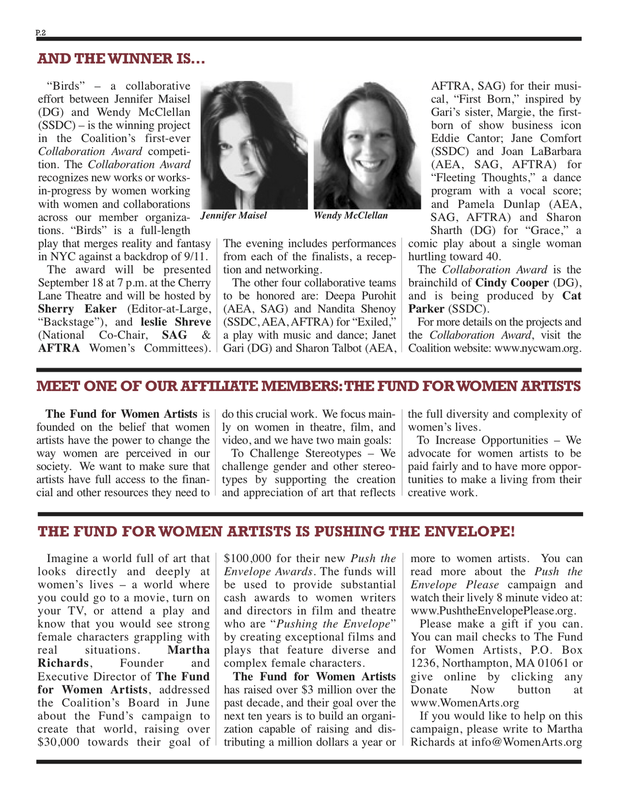 The Award recognizes new works or works-in-progress by women working with women. The winners will be honored at a special event on Monday, September 18, 2006 at 7 p.m. at The Cherry Lane Theatre in NYC (38 Commerce Street). The evening will include a reception, performances from the winners, a panel, and trademark networking. Tickets are $10.00 in advance and $15.00 at the door. Four other collaborative teams are being honored with an award certificate. They come from disciplines in dance, theater, musice theater, varrying backgrounds, and a variety of styles. The jam-packed awards event, "Collaborate! Communicate! Celebrate!" on Sept. 18 will be hosted by Sherry Eaker, editor of Backstage, who will collaborate as moderator with leslie Shreve, National Co-Chair of the Women's Committees of SAG and AFTRA, an Emmy Award winning activist and a producer at NYC WildFlower Productions. Tips on collaborating ups-and-downs will be elicited from winners in a quick Q&A conducted by director Aixa Kendrickand playwright Cindy Cooper, and signature networking (see Blatant Self-Interest Networking Events Past Events) will help attendees identify their own future collaborators. A reception will follow. Teams from ten states and the United Kingdom submitted applications for the Award, which carries a prize of $500. The winning entry is a full length play entitled Birds that merges reality and fantasy in modern day New York City. Against a backdrop of 9/11, a woman tries to break free from her past through a series of clandestine encounters. “I see the unfolding of the play as one of a caged bird tearing itself free,” says playwright Jennifer Maisel. Director Wendy McClellan says she sees the play as a “noir-esque” video game, the characters as iconic images moving through the play as through a video game. This is the third collaboration for Maisel and McClellan. Maisel, a member of the Dramatists Guild, has an MFA in dramatic writing from the Tisch School of the Arts at New York University and has had plays produced at the Humana Festival at Actors Theatre of Louisville, Theatre J in Washington, DC and Center Theatre in Chicago, among others. She has received grants from the Fund for New American Plays, has twice been a finalist for the Heideman Award from the Actors Theatre of Louisville, and has written for television and films. She lives in Los Angeles. McClellan, a member of the Society of Stage Directors and Choreographers, has directed productions at The Kennedy Center, the Players Theatre in New York, Actors Theatre of Louisville, P.S. 122 in New York and Oasis Theatre in Los Angeles, among others. She is the director of the Apprentice/Intern Company at the Actors Theatre of Louisville. The Coalition of Professional Women in the Arts & Media was organized in 1990 to work for the advancement of women in the performing arts and media industries. Members and Affiliates include: Actors’ Equity Association (AEA); American Federation of Television and Radio Artists (AFTRA); Dramatists Guild (DG); The Fund for Women Artists; League of Professional Theatre Women/NY; New York Women in Film & Television; Screen Actors Guild (SG); Society of Stage Directors & Choreographers (SSDC); Women Make Movies, and Writers Guild of America, East. 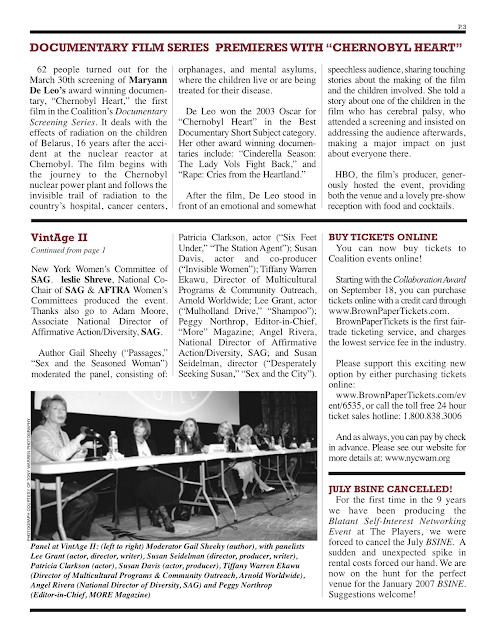 Film Series: On March 30, 2006, The NY Coalition hosted 'Women Screening Women' Documentary Film Series with a showing ofChernobyl Heart and TalkBack with filmmaker Maryann De Leo. "The Coalition is a marvel of Networking. At least from my perspective. As a member of Actor's Equity and The League of Professional Theatre Women I attended a Coalition Networking event. All I expected was to meet some interesting people. Through an amazing and helpful women, a master networker, I found a video editor/producer, a personal assistant, and an extraordinary writer/director for my one person play, Good Lessons from Bad Women. All of this from one connection. Amazing. Thank you Coalition." "My name is Terry Diamond. I am a playwright/director and have been attending NYCWAM networking events since 2003. 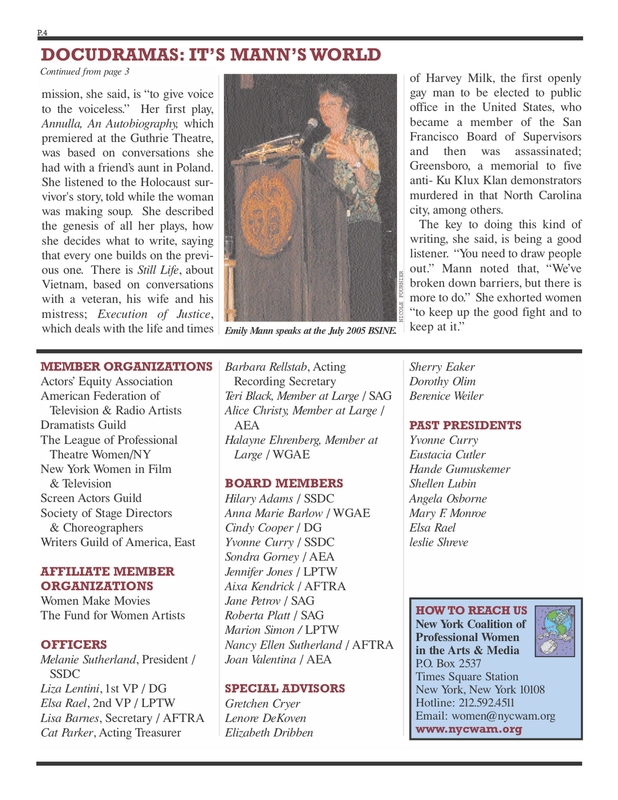 I went to my first NYCWAM BSINE at the Players Club in 2003. I was planning to produce a show in Spring 2004. At that event, Sally Plass the proprietor of Plass Prop House handed out flyers for her prop services. I took her flyer and when I needed a set and props I called on Sally. She dressed my set and it looked great. She offered a very modest rental fee because her business is non-profit. A few months later, I helped Sally get a "services to the field" grant, the first ever grant for Plass Prop House from NYSCA. 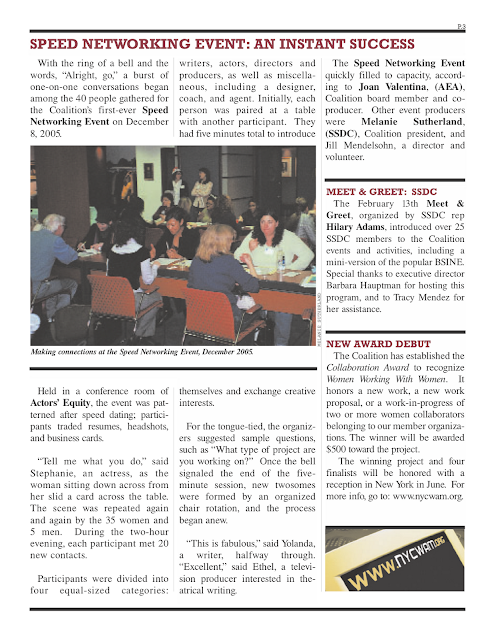 The next networking event I attended was in January 2004. I met Lisa Haas, a playwright/performer. Sharing a similar sense of humor we connected professionally. In the next few years, we developed and enoyed a very warm collegial relationship. We support each others work and regularly pass on opportunities that come our way. I think NYCWAM's networking events are a very effective away to avail myself of the collective resources of professional women in the theatre, arts, and media and to offer my own." "The events I've attended, Networking, and Perfecting Your Pitch, were well run, created a warm atmosphere, and provided help in areas that are important to me as a musical theatre writer. I met people who were investing time and effort to climb professional ladders, and whose activities and persons were in themselves interesting. We spoke the same language, an opportunity for which I sincerely thank the Coalition." "The coalition is totally awesome... really. At the very first coalition event I went to I made many connections, including two who became clients and one who I swapped services with and who has become a close associate".